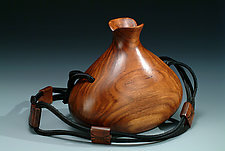 "I have the desire to show off the beautiful grains of the wood I carve in a new and unexpected way." 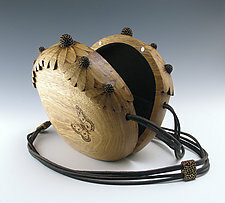 Woodworker, sculptor, and handbag designer Kimberly Chalos has always been drawn to the versatility of wood and its creative possibilities. Chalos's line of handbags includes her Signature Series, which features soft, flowing curves in a contemporary style, and her Flower Series, both inspired by her love of nature. 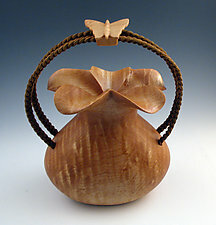 Kimberly Chalos starts out with two pieces of wood sandwiched together. 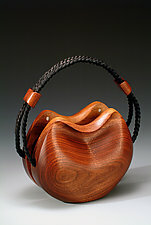 She then hand carves the inside of each piece of wood for the storage compartments. After drilling the holes for the hinges, she shapes the outside, then carves out the compartments again, ensuring the walls are thin enough to keep the weight of the handbag down and make more space inside. Once the handbag is shaped, she adds the magnetic closures, applies the finish for four days, then attaches the elastic and lining to the inside of the handbag. Chalos became interested in primitive art from different cultures after college. While making a reproduction of a Tlingit rattle from the Northwest coast, she noticed the hollowed-out rattle sitting upside down on her worktable. 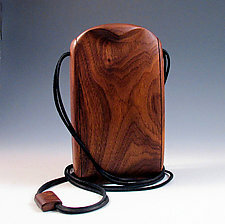 Chalos thought, "What a unique handbag that would be." 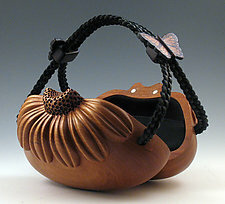 From that thought came a whole line of handbags carved from wood.